In the world of mega-hosting services like GoDaddy and BlueHost, Hosting.com is a small fish in a big pond. They currently serve just over 2,000 customers, mostly business websites for industries such as financial services and healthcare. They use cloud integration to make their hosting services more reliable, and are backed by an equity firm to ensure they stay a profitable company. While the company has been around in some form since 1997, it wasn’t until recent years that they debuted their unified cloud hosting space, and began establishing themselves as leaders in cloud database services. With so few customers compared to the big names in shared hosting services, it can be difficult to find reliable reviews. 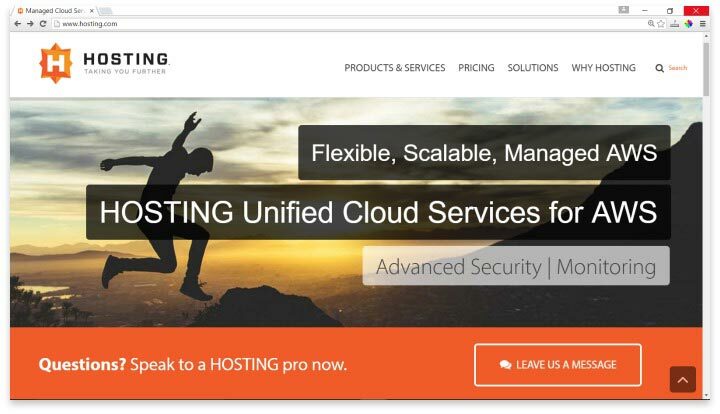 Hosting.com is not a service for the average individual consumer or small business; rather their hosting services are customized for healthcare providers and financial institutions, where privacy features are extremely important. Their features and pricing reflect this focus. There are three service tiers, and each includes cloud management, security and database management, and other great features. The most affordable option starts at $250 per month, and the most feature-heavy tier jumps up to $5,000 per month, with it’s own premium IT service attached. Each tier offers at least some dedicated IT service, so customer service wait times are never an issue. If something goes wrong with your website, Hosting.com’s IT service will be there to fix it. With plenty of infrastructure management options, you can be as involved as you wish with your website development and management. While the features remain some of the best and most comprehensive in the industry, reports from consumers show that the tech support, while always available, isn’t the most skilled option. Multiple reports tell of how the IT service was inexperienced and unwilling to fix issues properly. The company did change ownership within the last five years, from HostMySite.com to Hosting.com, and this change seems to have been the source of many issues during the transition. Additionally, users report that it is difficult to cancel services, or to take advantage of the 30-day money-back guarantee. Hosting.com may be a good choice for larger businesses, or businesses in the healthcare or financial industries. While at first glance, Hosting.com does appear to be a good choice for larger businesses, or businesses in the healthcare or financial industries, a closer look reveals a few concerns that may make this service one to avoid. Despite having been around since the late 1990s, they still only serve 2,000 customers. Compared to GoDaddy, which was hosting over ten million before their first decade was up, Hosting.com appears to be of lower quality. With such high prices, and with the reports that their customer service isn’t always well-trained, most users would probably be better served using another hosting site. While most users may be willing to take the plunge considering the 30-day money-back guarantee, Hosting.com’s reputation for being difficult to work with on cancellations may make that route too risky. The bottom line is that there are many other hosting services out there with similar features, millions of happier customers, and far more affordable payment plans that can work for any business of any size. Hosting.com appears too risky to take a chance on for now. Have you had an experience with this company? Please share your Hosting.com reviews below. These guys used to be great about 12 years ago when I had a dedicated server with them for several years. The company was then called HostMySite but they were acquired a few years back and the quality of their support tanked soon after that. Not worth the prices they charge. - CONS: Too expensive compared to competitors who offer the same or better product for lower price.